It’s hard to believe that summer is quickly coming to an end and school is soon to begin. I remember when I was a little girl it felt like summer lasted forever, now that I am a mommy it feels like a flash! Our family has had a full and fun summer, but as we start to think about a new school year, easy and healthy breakfast ideas are at the top of my list to fuel my kids healthy for the day. Many studies consistently show that children who eat a healthy breakfast perform better academically, have better concentration, memory, attention span, participation, nutrition, and alertness versus children who skip this important meal of the day! Breakfast truly is important to fuel the brain and body after fasting through the night. It’s important to keep the brain powered up, so breakfast needs to be rich in protein and healthy carbohydrates like whole grains. Eating a healthy breakfast does not have to be complicated or take much time. A little preparation the night before can help fast mornings stay healthy – but there are also some healthy, fast options on the market too, like Purely Elizabeth. I am a big fan of Purely Elizabeth because of her holistic and nutrient-rich approach to the ingredients used in the products. I have teamed up the Purely Elizabeth to share a few fun ideas for breakfast that the kids will love – different, easy, and full of nutrition. The first Purely Elizabeth product I bought about a year ago was the Chocolate Sea Salt and probiotic granola … I was hooked! It was so delicious and so nutritious. Purely Elizabeth has several granola brands to choose from along with granola bars powered by Reishi mushrooms, plus superfood oats, and quick vibrant oat cups. Organic superfoods like ancient grains and seeds, raw virgin coconut oil, coconut sugar, pitaya, turmeric, and spriulina are included in her foods. Furthermore, the wholesome ingredients used are non-gmo, certified gluten-free, vegan, no artificial flavors, no additives, no soy. When it comes to healthy, quick breakfast ideas, I fully trust Purely Elizabeth is a brand that will deliver quality nutrition to get the day going in a healthy direction. Lets dive into a few ideas before the school year begins. I am loving the new vibrant oat cups that can literally be made in minutes or overnight. There are 3 vibrant oat cup options all powered by superfoods and ancient grains: The Rasberry Pitaya, Blueberry Lemon with spirulina, and Coconut Tumeric. All three are delicious and so naturally colorful, and my personal favorite is the Coconut Turmeric. Why not jazz up the morning before a full day at school with a Unicorn parfait! 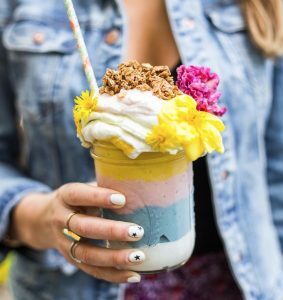 This version of a unicorn parfait is super easy, very hearty, and so fun. Using the 3 vibrant oat cups, simply follow the directions on the cup for heating or overnight option. Layer the cooked and colorful oatmeal in a 16 ounce cup with fresh fruit between the layers. Top with the granola pack that comes with the vibrant oat cup or fresh fruit. This can be made the morning of or the night before providing a super nutritious start to the day for both kids and parents, plus it’s a fun breakfast to share. Sushi for breakfast….yup! This sushi kids will devour and it is so fun to make the night before or in the morning. It combines healthy carbohydrate, healthy protein or fat, and super healthy toppings. 1-2 tbsp peanut or nut butter of choice. This is such a fun and easy recipe that kids can create too. Take a peeled, whole banana, spread either the Nut butter or Greek yogurt over banana until covered well. Sprinkle the banana with coconut, chia seeds, strawberries or granola, coconut and chia seeds. 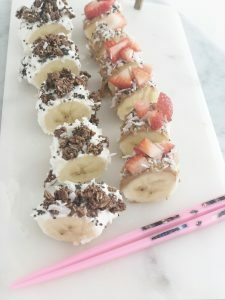 Slice the banana like sushi and serve….. super easy, fun, and a little different from the normal banana. This recipe can really be tailored to personal tastes as well using different, healthy toppings. This is great for a fun and filling breakfast option but also a great after school snack idea. Enjoy! This version of a donut is a protein-packed breakfast that is super nutritious, filling, and fast. 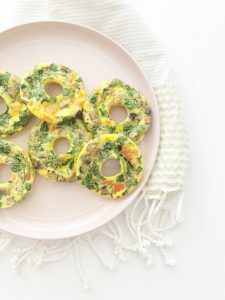 Really the recipe is basic eggs with a colorful mixture of vegetables for an extra pop of nutrients in the shape of a donut, taking the place of a normal surgery donut. This recipe can also be made the night before and holds well for 2-3 days in the refrigerator. It is an easy donut to warm up and head out the door in the morning, plus a Purely Elizabeth granola bar would be a great addition to add with this egg donut. Top this breakfast with a glass of milk and side of fruit and voila …. another filling and healthy breakfast accomplished. Chop all vegetables and chives and set aside. In a bowl, crack and whisk 5 eggs, add milk(optional), continue to whisk. Add all vegetables, chives, and cheese(optional), and a dash of sea salt and pepper. Whisk and stir to combine well. In a nonstick donut pan, pour egg mixture in each donut space. Bake at 350 degrees for 12-15 minutes. Remove from oven and serve. This recipe can also be made the night before and then re-heated for those fast mornings we need to grab and go! Enjoy! As the school year kicks into full swing, grab some Purely Elizabeth and give these fun, kid-friendly recipes a try. Giving kids a healthy start to the day is essential … and eating healthy can be creative, fast, and different from the normal bowl of cereal. Parfait, Banana Sushi, and Egg Donut cheers to a healthy school year!